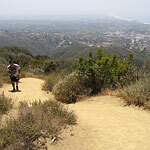 Los Angeles has a wealth of good metro-area hikes, though finding them can be challenging. 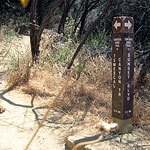 One of my favorites is the Phil Leacock Memorial Trail, which connects Pacific Palisades to the Topanga State Park trail network. 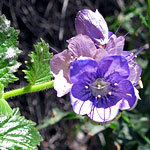 For the urban hiker, the Leacock Trail offers tremendous bang for the buck. You get a sharp climb right from the start, great city and ocean views, and a quick loop (about 1.5 miles) back to the car. Best of all, parking is free and abundant. 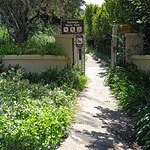 From Sunset Boulevard in Pacific Palisades, take Bienveneda Avenue north to the end of the road (about one mile). Park on the street outside the gated community, then look for the trailhead and park access sign hidden in the foliage just to the east. Starting elevation is a lowly 700 feet, so you can't unfortunately blame your huffing and puffing on altitude. Also, Dogs are not allowed here, even on a leash. Right away the trail starts climbing aggressively. Now would probably be a good time to mention that weather is almost always warm around here. As with all hikes in the Santa Monicas, steer clear of high noon and/or burning hot days unless you're really in the mood to sweat. Total vertical gain to the ridgetop is around 500 vertical feet (or more if you venture farther into the park), making this a great training hike for the time-challenged—especially if you strap a 30-pound boy to your back. 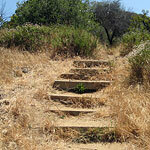 After a short series of wood steps, the trail dives into the impressive brush of the Santa Monica Mountains. Watch out for low branches over the trail. 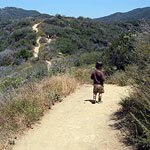 Solo hikers should also watch out for mountain lions. Lion attacks here or anywhere else within Topanga State Park are extremely rare, of course, but a little extra anxiety helps keep you on your toes. As for human traffic, the Leacock trail enjoys fairly steady but light use from the lucky local residents. 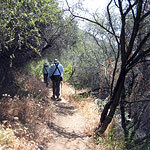 You may also catch an occasional ranger-guided group enjoying a nature walk. After 1/4 mile, you come to the loop junction. From here, you get a nice look at the very expensive homes built deep into the Santa Monica Mountains while you choose to go right or left. 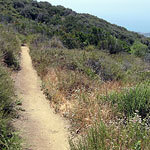 Either way leads to the Temescal Ridge Trail above. I like staying to the right, which is the fastest way to the top, and the best way to get the pulse pounding. If you do go right, you soon come to another junction. This time veer left. In fact, for the purposes of our loop, we'll be taking the left branch of ever fork from now on until we return to the Bienveneda-Leacock junction. Climb, climb, climb now as the trail moves upward with gusto. Thankfully the overhead branches here keep the worst of the sun off your head. After an occasionally quite-steep ascent, you pop out of the bush onto the ridge, getting your first good look around. The view continues to improve as you climb a mercilessly sunny and steep section of ridge for the lash hurrah. Put some extra kick in your step here to pass any straggling natives you may encounter. Now stop at the flat spot to catch your own breath—and take in those views. Downtown L.A. is visible to the east, depending on fog and air quality. The Pacific Ocean from Palos Verdes to Malibu dominates the westward horizon. From here we meander along a short section of the ridge trail, a little over a hundred yards or so, until you find the sign pointing back down to Bienveneda. If you keep going straight here you'll traverse the whole Topanga State Park, ending up somewhere in the San Fernando Valley, so keep a sharp eye out for the route back to the car. This part of the loop drops at a much more gentle angle, switch-backing down at a casual pace that offers plenty of time to reflect on the over-the-top mansions perched atop the ridge to the west (whose inhabitants, no doubt, pay less property tax than you thanks to that California Institution, Prop. 13). Soon enough, it's back into the bush, en route to the rendezvous with the Leacock Trail. Dodge a few darting lizards here and there, watch for steep loose sections, and you're back at the junction, with the car just a short way beyond. Bring a stopwatch next time to try to beat your record, or come back at sunset to really put those ocean views to work. And just like that, you're back in the thick of the city, planning your next little mini-getaway. -- "... especially if you strap a 30-pound boy to your back"
So, will you be doing a 30-pound boy gear review/round-up anytime soon? 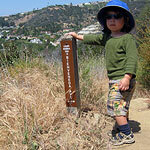 We found the trail to be a good climb and energizing, especially since we had only the late part of the day to hike. A good view. of the water and hills. Bring a good drink of water to relieve the thirst. A Very Good Enjoyable !! !